Approaching the porch there is a Bench Mark carved into the left hand upright. Ordnance Survey surveyors carved these to provide points where heights had been measured precisely. The porch itself has stone seats and a 15th century Holy Water Stoup, with traceried panels and a cut away lip, oak beams and a fine, old, heavy, nail-studded door. One stone has a carved niche – but its origin and purpose is unknown. The door is made of four oak panels with wrought iron hinges. It is undated but it is thought that it could have originated during the 1595 rebuild. A closer examination reveals that at some time the door was rehung as it was originally hinged at the opposite side. It is double sided with vertical panels on the outside and horizontal panels internally. The right hand external panel has, at some time, been renewed. The old key is now housed in a box inside the church. The inner porch dates from 1965. The tower was built sometime during the 15th century, as evidenced by the huge stones and is the oldest part of the church. There is a narrow door which is the access into the tower and leads to the roof and belfry. There is evidence of the gable line of a smaller but much steeper, possibly thatched or rush-covered roofline, on the east side of the tower arch. The Churchwarden’s accounts for 1578 show that the roof was repaired with moss, stone and hair and the walls were plastered over. Thomas Greenwood, a farmer was paid £1:2:0d (£1.10) for stone and hair, William Peocop 6/-d (30p) for 6 loads of lime and John Rishton 8/6d (42p) for ‘laying it in the church and the church walls’. There were apparently three bells in the mid 16th century, but two of the bells valued at £4:2:6d (£4.13) were confiscated by the King’s Chantry Commissioners in 1546/7. The Commissioners also confiscated an 8oz silver chalice, 2 vestments and the land included in Thomas Hesketh’s endowment. In 1866 Mears and Stainbank (perhaps better known as the Whitechapel Bell Foundry in London), recast the remaining bell and it was re-hung on the original three-bell frame. It was recast again in Loughborough by John Taylor in 1924 and then hung on a new bell frame. The bell is in G and weighs 11cwt, 3 qtrs and 21 lbs. The stained glass window in three sections by A Ballantine & Gardiner of Edinburgh, depicting the Crucifixion, was installed in 1892/3 to the memory of Richard Haworth. The wooden panel below the window is the Reredos of the 1881 Holy Table with its pictures of the Annunciation. The four panels, which were originally sited each side of the Reredos in the Sanctuary, date from 1899, and contain the Creed, Ten Commandments and the Lord’s Prayer. They can now be seen either side of the tower arch where they were relocated during the alterations in 1953. The tower had gallery seating but the original was pulled down in 1780. Another gallery with room for 10 families was erected but that too was replaced by tiered seating in 1901. The present seating and lighting was installed in 1965 as a result of a bequest from Seth Catterall. The clock in the tower was installed in 1953. Externally, the position of the now blocked up west door can be seen, above which is a canopied niche. The nave of the church was rebuilt around 1595, probably after the fire in 1591. It consists of five bays with an arcade of low pointed arches. The style of the windows is similar to that of the manor house of Martholme, which Thomas Hesketh’s son (also called Thomas) repaired. He was still living there in 1559, and it is more than probable that he was responsible for the rebuilding of the church. According to the registers, two of his sons were buried here. In the 16th century rebuilding, the nave and sanctuary were included under one roof in a rectangular building without any structural division. It remained so until the chancel extension of 1881. The position of a mediaeval Rood Screen can still be seen where the rood beam was fixed to both sides of the Nave walls. The new nave would be open to the rafters. It was ‘ceiled’ over in 1774 by Edmund Hodgson, a plasterer. Examination of the ceiling appears to show that it was never intended for this church since the principal timbers do not match the spaces between the Clerestory windows. The heavy, oak beamed ceiling could also be said to be too finely worked to have been meant for what was then a country church. There is an unproven theory that it came from Whalley Abbey! Apart from the chancel, the main part of the church is substantially as it would be during the reign of Queen Elizabeth I, However, the nave was extended during the building of the Chancel and additional windows were inserted in the nave. There were originally three doors into the church. The main door being through the porch in the southwest corner. There was a door in the west face of the tower. The third door was in the north wall of the church traditionally named the ‘Devil’s Door.’ It would be left open during a baptism to let out any evil spirits in the child. Following the reformation, many ‘Devil’s doors’ were blocked up as was the west door. People could be buried inside the church if they paid 12d (5p) in 1578 whilst burials in the graveyard cost 3d. That was still the case as late as 1821, – providing that there were no internments near the walls or pillars. However, the cost had increased to three guineas! Six ledger (grave) stones have been visible in the floor of the nave. There is one inside the entrance porch; four in the centre aisle and one in the north aisle. These are now protectively covered by the floorcovering and are dated between 1623 & 1781. However, there may be others under the pew platforms. There were 13 Faculties granted for box pews in the church between 1754 and 1833. Records show these mainly along the wall sides and adjacent to the chancel. When the church was extended in 1881, there was a need for more windows. Two were inserted in the north aisle. These are easy to identify by looking closely at them. The original windows have chiselled stonework whilst the stonework of the new windows has been machine cut. Two new pillars at the east end of the nave were required and these can be similarly identified. The builders reused the original half pillars at either side of the chancel arch. Two windows were also inserted in the south aisle in similar positions. In the more easterly of the windows are two fragments of ancient glass, bearing the initials ‘TH’ and the sheaf of corn, which appeared on the Hesketh coat of arms. These presumably came from the old 1521 chantry chapel. The glass in the second window of three lights depicts Mary at the Empty Tomb “He is not here: for he is risen, as he said” (Matt. 28.6). The third window of three lights is ‘Jesus the Bread of Life’. This window was inserted during the chancel extension of 1881 and from inside church it can be plainly seen how this was built into the existing fabric. All are by A Seward & Co of Lancaster and date from around 1905 and 1912. Nearby is the piscina, (a recess in the wall with a drain for washing the communion vessels) which would have been near to the original altar before the chancel was built. The window at the east end of the south aisle is by A Ballantine & Gardiner of Edinburgh (circa 1901). It depicts ‘Jesus the Way to the Father’ from John 14:6 “I am the way, the truth and the life”. 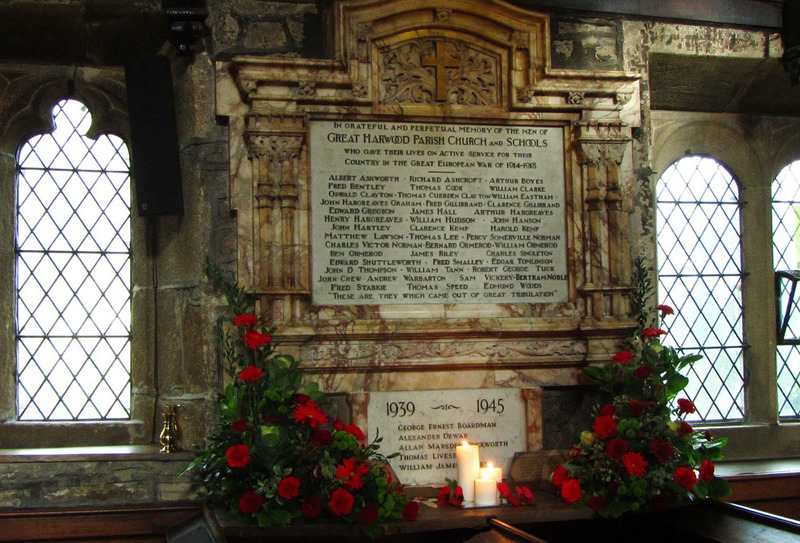 On the north wall is the War Memorial dedicated to those of the parish who lost their lives in the two World Wars. During 1934 the two front pew of the north aisle were removed and a Children’s’ Corner was made as a memorial to the late Vicar, the Rev A F Johnson at a cost of £79 2s 5d (£79.12). It was dedicated on October 9th. The Faculty was granted by the Chancellor on condition that Holy Communion should not be celebrated at that Altar. Many local families donated the centre aisle lantern lights when electricity arrived in the church during August 1936. It also enabled an electric blower to be installed in the organ. The south aisle was re-roofed (2010) as it was found that the roofing timbers had not been tied to the nave’s south wall. Shortly afterwards, the main and north aisle roofs were also found to be in need of re-roofing. 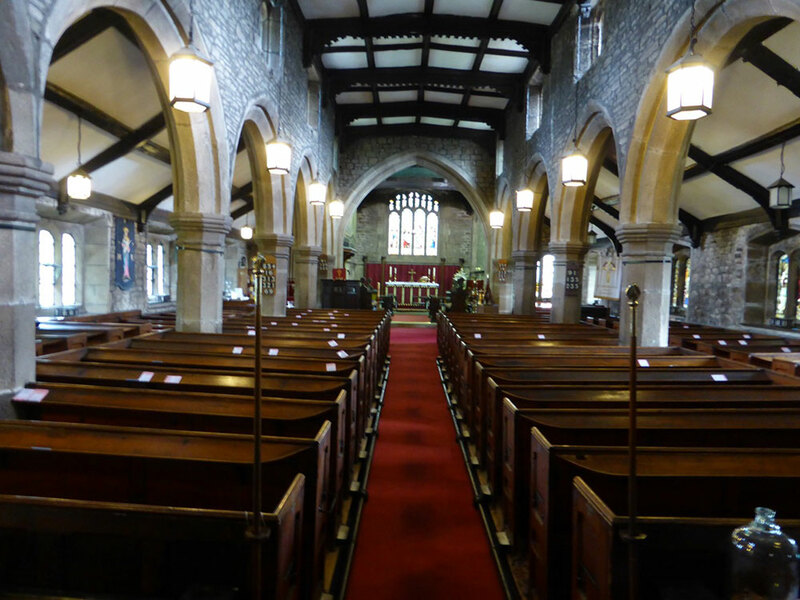 That work, along with new radiators, the removal of pews and the floor leveling was completed in 2016 thanks to grants from the Heritage Lottery Fund, Lancashire Environmental Fund, Windfall Fund, a number of others – and not forgetting the fundraising events run by the parish. The total cost was over £200,000. 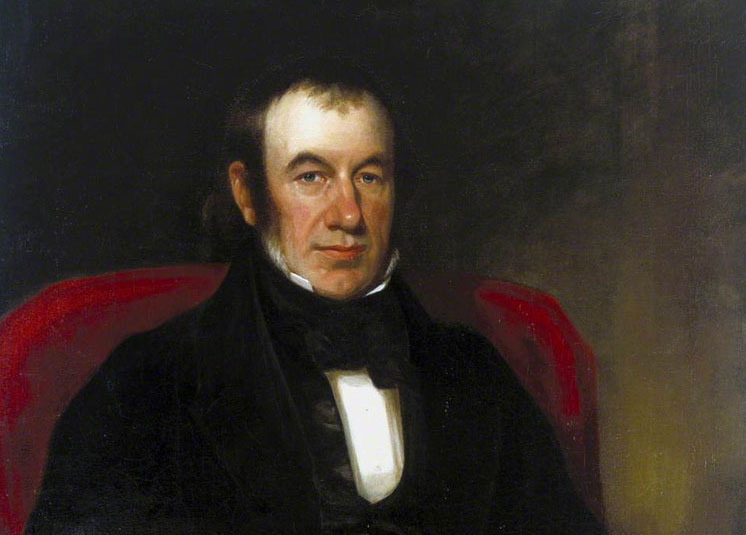 During the second half of the 19th century, Great Harwood was growing rapidly. New houses had been built for the families who flocked in from country districts to work the looms in the newly erected mills. It was a time of prosperity, and so it was decided to enlarge the church by building a Chancel, vicar’s vestry and organ space. It was designed by Austin & Paley, Architects of Lancaster, and cost £2,000 to build in 1881. Care was taken to match the style of the old church, and a more careful inspection will show that the two arches and pillars nearest the chancel were new. The original pillars of the 16th century nave were built into the bottom of the chancel arch beside the pulpit and the vicar’s stall. The aisles were extended and the two windows inserted into each aisle wall. The east window of the 16th century nave was reset in the end wall of the vicar’s vestry, and can be viewed from the outside. James Powell & Sons, London erected a traceried window, designed by Henry Holiday, of four lights in 1889. The four lights depict the Nativity; The Presentation; St John leading Mary from the Crucifixion; and Jesus appearing to Mary Magdalene. It is dedicated to the memory of Robert & Jane Clegg of Sparth House, Clayton -le -Moors by their daughter Jeanette Mellor. 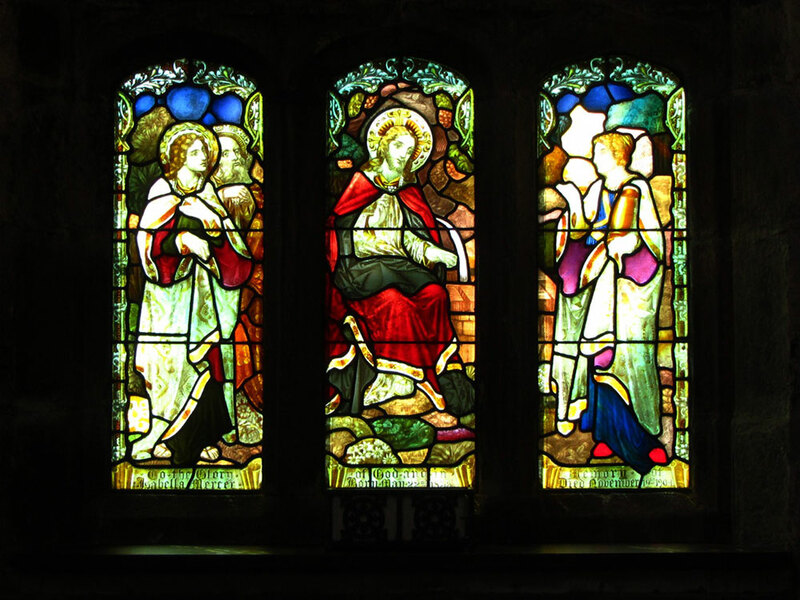 The two stained glass windows on the south side of the Chancel, a saint kneeling before an angel and Jesus’ Charge to Peter are by Ballantine & Gardiner, Edinburgh, and were erected around 1890, by the parishioners in memory of Rev William Maude Haslewood. He was vicar from 1861-1888, which included the period when the church was extended and the chancel built. His grave, surmounted by a cross, can be seen in the graveyard. In 1953, there were alterations to the sanctuary when an English Altar with Riddel Posts was installed. The Reredos and the four panels containing the Creed, the Lord’s Prayer, and the Ten Commandments were moved to the walls of the Tower. The altar was subsequently moved slightly forward and the Riddel Posts were re-positioned along the east wall. The plinth was extended during the 1990’s to provide more space behind the altar. 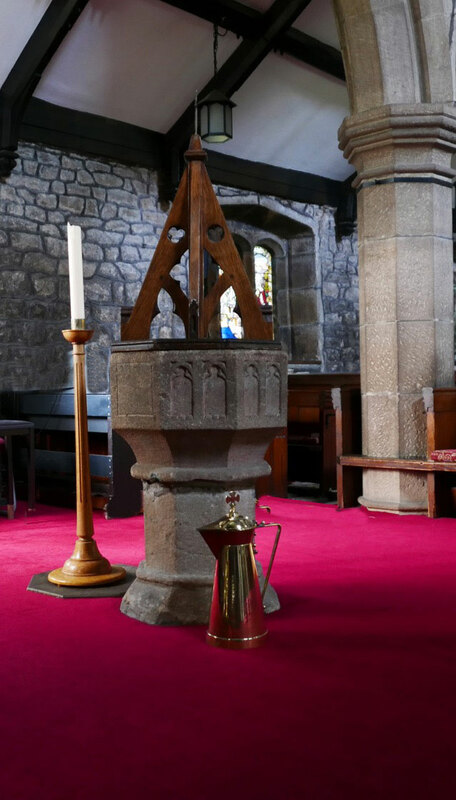 A Red Sanctuary Lamp glows in front of the altar to signify Divine Presence whilst there is an Aumbry – a small lockable cupboard, on the north wall of the Sanctuary and a Sedilla or stone seat on the south wall. An organ was installed in 1872. It was replaced by a new two manual organ built into the new chancel in February 1898 by Forster and Andrews of Hull. 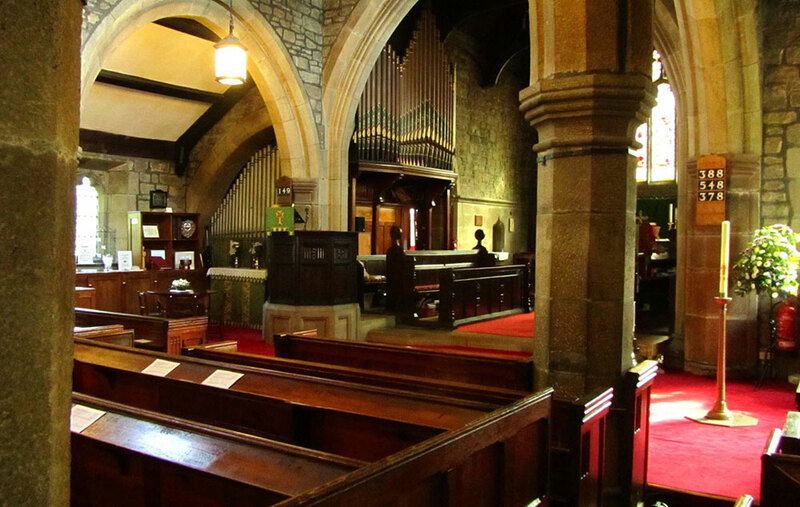 The organ, which cost £450, was the gift of Robert Clayton of The Turrets in Rishton. The instrument was completely rebuilt in 1977 by George Sixsmith of Ashton-Under-Lyne. The church has had a long musical history. There was a singing pew which was the only pew in the church with the exception of those belonging to the Lord of the Manor in 1578. An inventory of 1767 lists a collection of books of anthems and instruments. In both 1728 and 1765 the ‘singing pew’ was said ‘to be needing repair’. In the register of 1812-1822, there is a note to the effect that the paid musicians of the church wanted to buy a ‘base-viol’ or fiddle. Apart from the few gravestones the rest of the floor was strewn with rushes. On special occasions such as rush bearing, singers would come from nearby districts such as Rishton, Langho and Haslingden. Sometimes they were paid 5/-d (25p) and at other times with hospitality. In the 1980’s it was decided to demolish the old choir vestry and to build an extension in its place to provide a toilet, more space for the choir and enough room to hold small meetings for various parish groups. Designed by Grimshaw & Townsend of Accrington, it was built at a cost of £28,425.75 with the wardrobes adding a further £1,400. The Bishop of Burnley dedicated the building on Trinity Sunday, 1988. The graveyard surrounding the church contained many family vaults, tombs and headstones. Between 1547, when the church records began, and 1888 when the graveyard was closed by Order in Council, 14,546 burials were recorded. By 1971-1973, many of the memorials had fallen into disrepair due to their age, and so the decision was taken to clear most of the stonework in order that the area could be grassed over and made easier to maintain. All the grave inscriptions were carefully recorded for posterity and today you can still see many of the headstones as they now form a pathway round the graveyard. The oldest gravestone is now to be found outside the door of the parish office on the north side of the church and reads “Hic Jacet Corpus Johan Smalley 1682” – Here lies the body of John Smalley 1682. John Smalley lived in the Upper Town of Harwood and in 1666 he paid 2s. 0d (10p) Hearth Tax, having one hearth in his house. The grave of John Mercer (1791-1866), a self taught chemist who devised the process of mercerisation, which gave cotton a quality lustrous appearance, made it stronger and easier to dye, is situated behind the church. The clock tower in the main square in Great Harwood and the Mercer Hall both bear his name as does Mercer Park in Clayton le Moors. There is a memorial plaque in the north aisle erected by his sister Maria Mercer. Part of the graveyard is now set aside for use as a Garden of Remembrance for the cremated remains of parishioners. 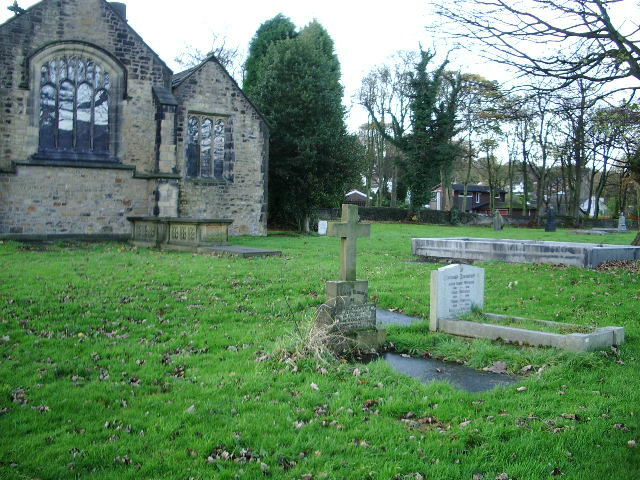 The parish also has an extension cemetery in Hope Street at the opposite end of Great Harwood. The ‘poppy head pew’ was an early attempt at seating in the church. ‘Pray for the soul of Hugh Stanworth and Letice his wife who caused this to be made’. Hugh was a Bondsman when Thomas Hesketh leased Martholme Hall to Christopher Duckworth in 1518 but he died before the parish registers were kept. It can thus be dated between 1518 and 1547. The old oak chest is made of huge planks and bound with large iron straps and hinges. It had three locks for safety, because this is where the church kept its registers and valuables as ordered by Queen Elizabeth I in 1597. The Vicar and the two Churchwardens kept the keys. 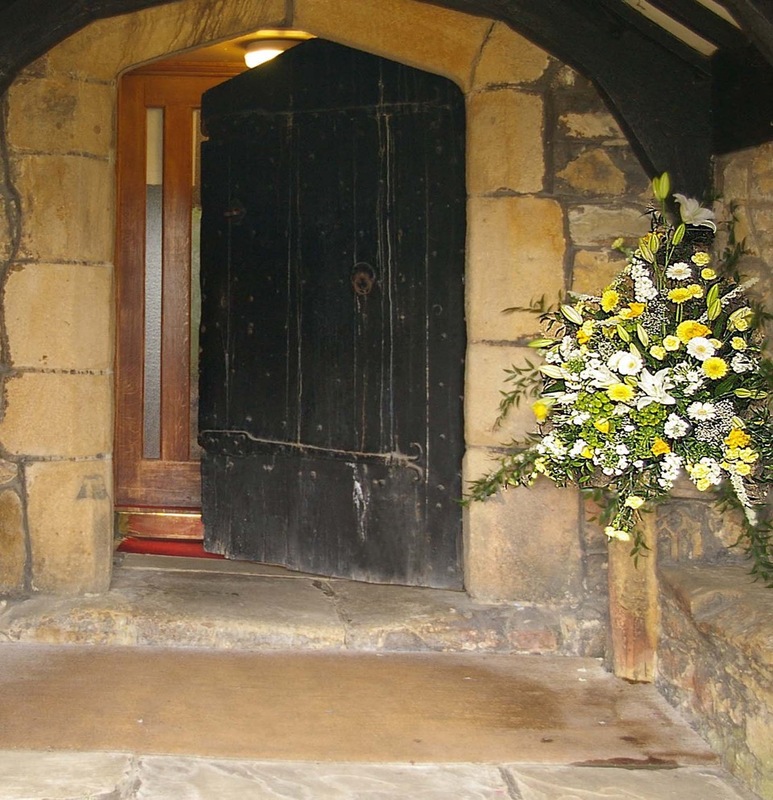 There was a chest in 1556 when the Churchwarden’s accounts mention a new bar for the front door and a new lock being fitted to the chest for three pence. So whether this is that chest, or a newer one, we don’t know. The font has been moved over the years from the North Aisle to the Tower area and to its present location between the nave and the chancel. Dated 1662, it bears the initials ‘I E’. These are thought to refer to John Eddlestone who was Churchwarden at that time. The cover dates from 1897 and replaced an earlier one from 1820. The “Children’s Corner” is at the east end of the north aisle. This was a memorial to another well-known vicar, Rev A F Johnson who was interested in the welfare of children. During his ministry, in addition to the formation of St John’s parish, two church day schools were built; Holgate Street (since demolished) in 1895 and Ash Street School, the present St Bartholomew’s Primary School, in 1915. A detailed chronology containing the social history of St Bartholomew’s can be found in the book ‘The Story of a Village Church’ by Louie Pollard, which is available from the Church. 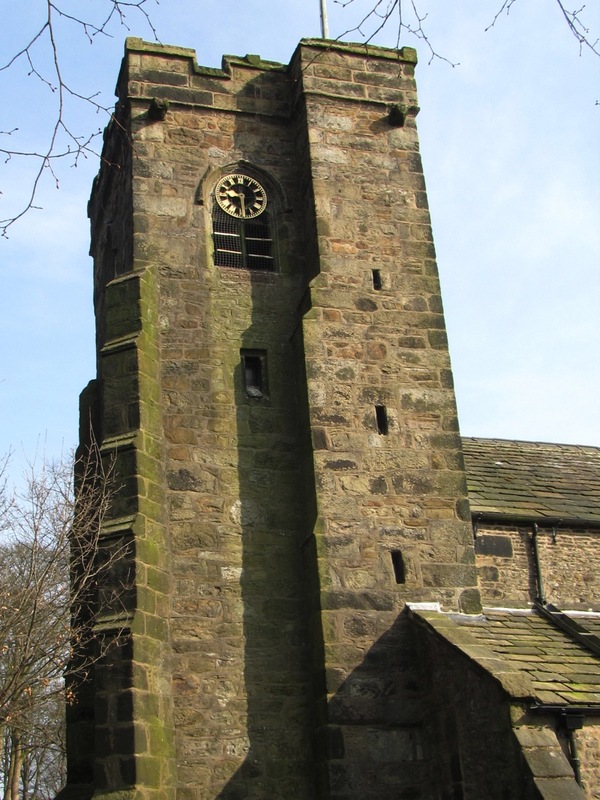 On Trinity Sunday in 1881, Rev William Maude Haslewood opened a Mission Church in the Old Butts Chapel on Delph Road. 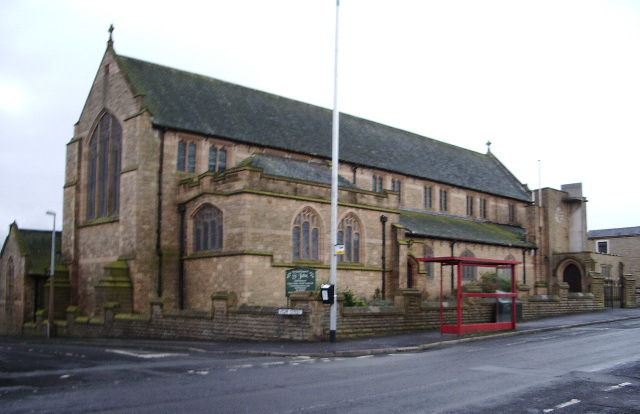 Services continued to be held there until St John’s School was built in 1888. Shortly afterwards land was obtained alongside the playground on which to build and an iron church (built from corrugated iron) was opened in November 1898. The vicar was Rev A F Johnson and the Curate was Rev, later Canon, James A Wilson, who was to go on to serve St John’s parish for over 50 years. In 1908, King Edward VII sanctioned a Deed of Separation and St John’s became a separate parish. Austin and Paley of Lancaster, who had designed the chancel extension at St Bartholomew’s in 1880, designed St John’s Church. Built at a cost of £8,000 it was consecrated on October 1st 1912. Robert Clayton of Rishton who donated the organ to St Bartholomew’s was also a benefactor to St John’s. He erected the Lady Chapel and donated the east window in that chapel in memory of his parents Jonathan and lice Clayton. During the 1950’s the east end of the church unfortunately was found to have very serious structural faults. St Bartholomew’s and St John’s were reunited as a single parish in 2006 and sadly St John’s church had to be demolished in 2009.